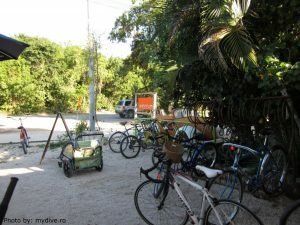 When I first got to Tulum, I was wondering if I didn’t arrive to the wrong place: the small and quiet town, with its main street crowded by souvenir shops and restaurants, didn’t quite seem one of the most beautiful places in the world, as described by the self-promotion websites. But we were to discover, day after day spent there, that Tulum is revealing itself to the visitor just like a flower, petal after petal, place after place, with every minute granted to its exploration. The picturesque Tulum equally means untouched natural space in the vibrant green rain forest, beaches which take your breath away, colorful and lively places – where you can enjoy delicious food over a good talk, amusement parks, archeological sites – which bring back the scent of long passed civilizations, fancy hotels, cenotes which make possible the access to the infra-world within the earth’s bowels and the list can continue, with examples, on pages and pages. 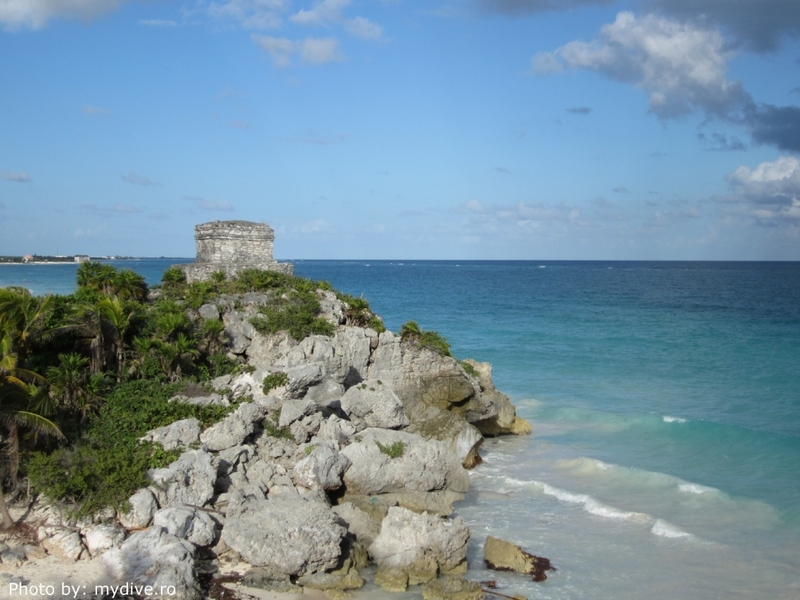 The present name of Tulum refers to the enormous walls which defended the sacred city built by the Mayans near the sea, the only one with such a placement (all the other sites are to be found in the middle of the jungle). Originally, the settlement was called Zama, The City of Dawn, and it had, in addition to its ceremonial function, a role of major commercial harbor in the region, being abandoned at the end of the 16th century. Nowadays, over 60 restored temples can be still visited in the archeological park of Tulum, revealing glimpses of the lavish ceremonial life which took place in the area at some point and placing the ruins on the third place among the hundreds still existing in Mexico, after Teotihuacan and Chichén Itzá. The most prominent buildings are the Castle, the tallest building in the complex, situated on a cliff facing the sea, and the Temple of the Descending God, renowned for the facade bearing the carved figure of a man which seems to execute a jump from a great height. All the beaches in Tulum seem cut out from postcards picturing exotic holiday destinations, in which the turquoise water – warm all year round – of the inviting sea is combined with the surreal blend of the fine sand, white-gold in color, and the palm trees guarding the entire seacoast. Probably the most famed beach in the area is Boca Paila, located at the intersection of the Caribbean Sea and the Muyil lagoon, a place of wild beauty, still not invaded by tourists, and a heaven for the recreational fishermen who want to enjoy absolute silence. Good to know that all beaches are public, even though you access them, most of the times, by crossing the private properties of the hotels situated on the beach.The touristic life of the small town takes place along its main street, easy to cover on foot in 15-20 minutes, offering the visitors souvenirs and diving equipments shops, restaurants and coffee shops, banks and exchange offices. Don’t expect aggressive vendors and take into account that any price is in fact negotiable, if you are patient enough. 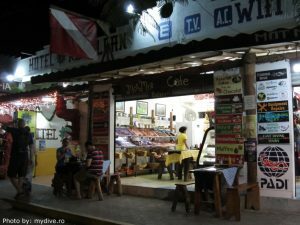 For a lively night life don’t rely on Tulum, perhaps visit Playa del Carmen or Cancun, a few tens of kilometers to the north. Three kilometers from the center one can take a road meandering along the sea coast, connecting several tens of hotels situated right on the beach. Following this road one can reach the natural reservation of Sian Ka’an, one of Tulum’s jewels which shouldn’t be missed at any cost. 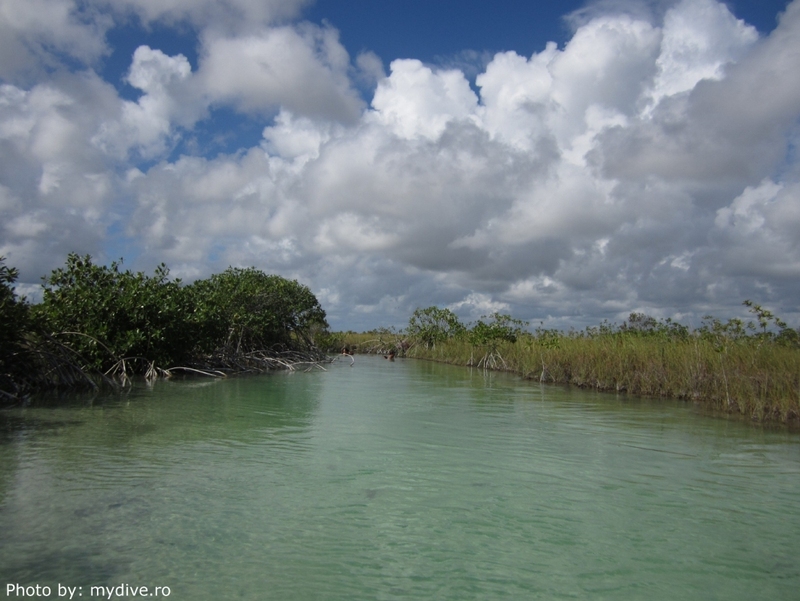 Sian Ka’an means in Maya “where the sky is born”, name which seems perfectly suited once you reach the vast area situated on the last floor of the CESiaK ecological center, the organization which insures that the impact of human activity on the reservation is minimized. The reservation is on the UNESCO heritage of humanity list and comprises most of the ecosystems which exist in the Yucatan peninsula: jungles, beaches, savannahs, swamps, brackish and sweet water lagoons, cenotes, underground rivers, an untouched coral reef, over 100 species of mammals and over 300 species of birds, to which are added over 20 archeological sites registered in the area. You can take part in various trips organized in the reservation, you can be closer to nature by living in one of the beachfront huts (no electricity, with shared toilets) or you can simply have lunch or dinner (the restaurant is excellent!) or savor a tea and enjoy the marvelous sight unfolding right in front of you. 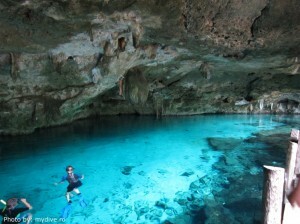 The cenotes also belong to the same series, of wonders-which-shouldn’t-be-missed. These are sinkholes formed within the soluble limestonerocks characteristic of Mexico, ending at the base with caverns and sinuous galleries, in which stalactites and stalagmites seem crocheted, as a milieu, by an artful grandma. Apart from being used as a source of drinking water, the Mayans considered them entrances to the infra-world and used them in various rituals. The magic natural landscape which these bring to life, unique for each cenote, and their clear water, with a constant temperature of approximately 25°C and up to 150 m visibility, attract numerous tourists for diving, snorkeling or swimming. The price for a snorkeling trip starts from 25 USD for ocean diving or 35 USD for cenotes and includes the entrance fees for some of the cenotes. For diving, the prices vary depending on the packages, but they usually start from 40 USD for a one tank dive in the ocean, 90 USD for cavern diving (and take into account almost twice the price for double tanks) and 80 USD for cave diving (with the same mention for double tanks). 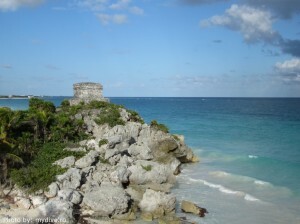 Tulum is, however, a starting point for other destinations close by. Just 10 kilometers north of it there’s the aquatic amusement park of Xel-Ha, where you can swim with dolphins or manatees, apart from other incredible fun activities. The “big brother” of Xel-Ha, Xcaret, is situated near Playa del Carmen, half an hour driving from Tulum. 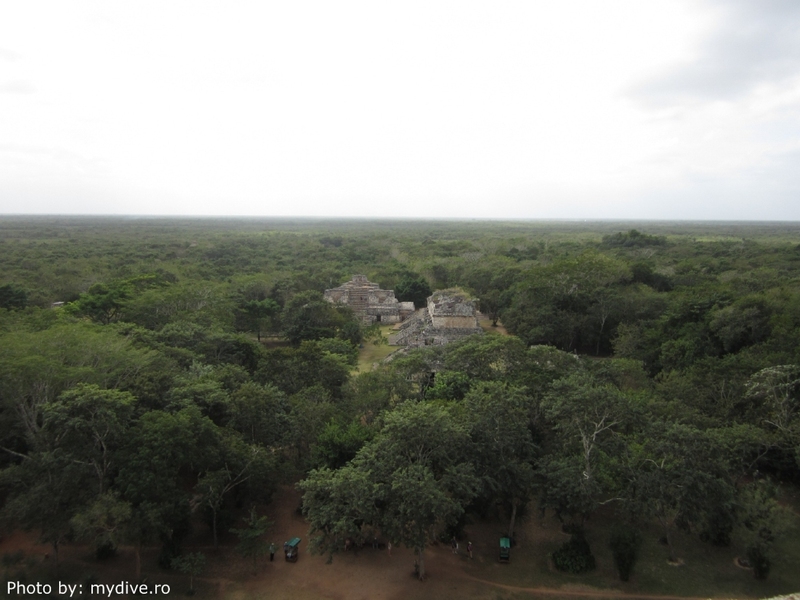 Several archeological sites are easily accessed from Tulum: Muyil, 22 km to the south, in the Sian Ka’an reservation, a six structures complex which can also be seen from the boat, and Cobá, 45 km to the west, towards Valladolid. The pyramid in Cobá, 42 m high, is the tallest Maya structure found in the Yucatan and offers an incredible view towards the Cobálake. On the same road, towards Valladolid, although further away and maybe more touristic, are worth a visit Ek Balam and Chichén Itzá, the latter being on the list of the seven modern wonders of the world. But by far, the best thing experienced in Tulum were, in fact, the people, more open, better and smiling more than in any other place. And if the Mayan meaning of the Tulum name is wall, today its role seems more that of defending against the speed and the turbulence of the current human society, as an oasis of silence in the middle of the jungle. People still preserve alive the old Mayan culture, speaking this mysterious language or bringing to the now Mayans beliefs and customs. Life has a smooth flow in the small town on the Caribbean coast and people are speaking without any trace of frustration about what they have and what they don’t, with the serenity and acceptance of wise people from times long gone. Or at least this is how we met them… Useful information: Tulum is located approximately 130 km south from the Cancun international airport and is easily accessible in about one hour driving on the highway connecting the localities distributed along the Mexican Caribbean coast. While one moves away from Cancun it seems like going back in time, with each locality you pass by, Tulum being such an example. The touristic highseason takes place from January to March, when the temperatures rise during the day between 27 and 30°C, and rains more seldom; on the other hand, expect a higher number of travelers for most of the touristic objectives during this time. 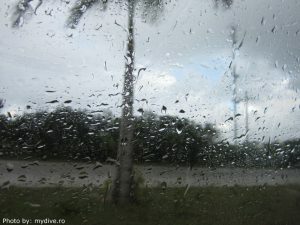 From April to June temperatures reach easily over 30°C and in June the chance of rain are a bit higher. As Tulum is located on the Atlantic tropical storms route (in season from June to November, with a peak between mid-August and mid-October), prices decrease abruptly from July to the end of November, but a holiday during this time has to take into account the possibility for tropical storms or even a hurricane to appear (although temperatures remain pleasant, a bit over 30°C). 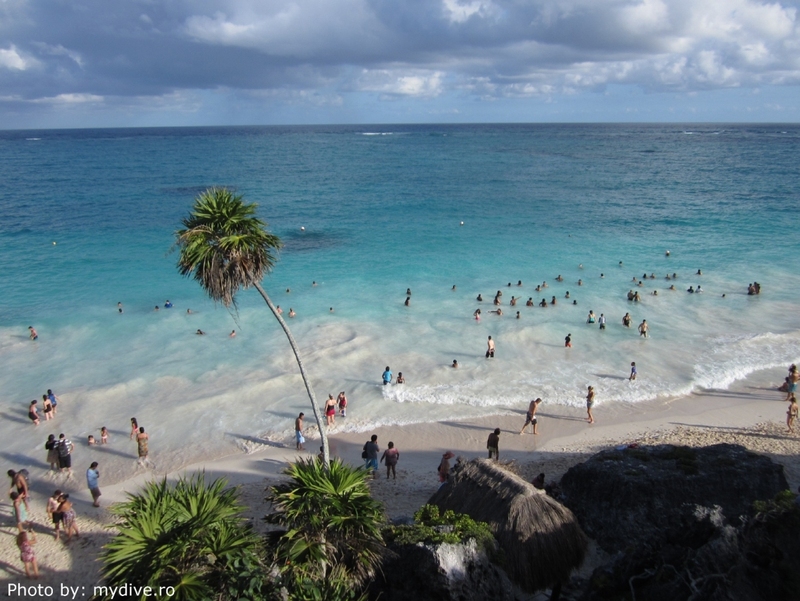 December remains thus a good holiday month in Tulum, like a window between the hurricane season and the touristic peak season. 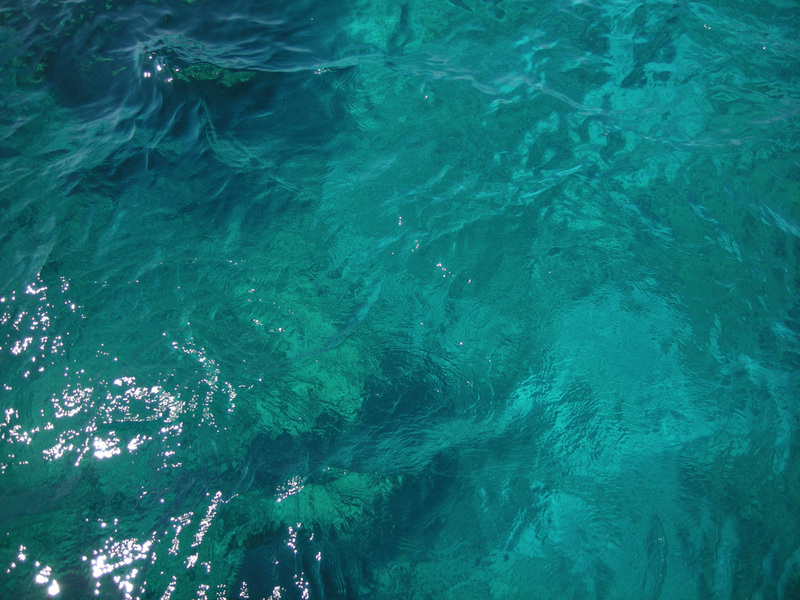 The sea water temperature varies during the year between 26°C (January-March) and 29°C (August-October). Prices are usually accompanied by the symbol $, but most of the times it refers to the local currency, pesos, not the American dollars. The latter are accepted in most of the locations in parallel to the pesos, but pay attention that the exchange rate is not set to your advantage. For exchanging money, preferably dollars to pesos, the first option is the banks, opened only Monday to Friday until 4:30 pm. The exchange rate in the exchange offices on the street is generally lower than the one offered by the banks. Prices for accommodation vary a lot depending on the hotel and the chosen travel package, between 55 and 400 dollars per night (per room). Most of the day trips organized by various agencies cost between 70 and 100 dollars and renting a car starts at 20 dollars per day. 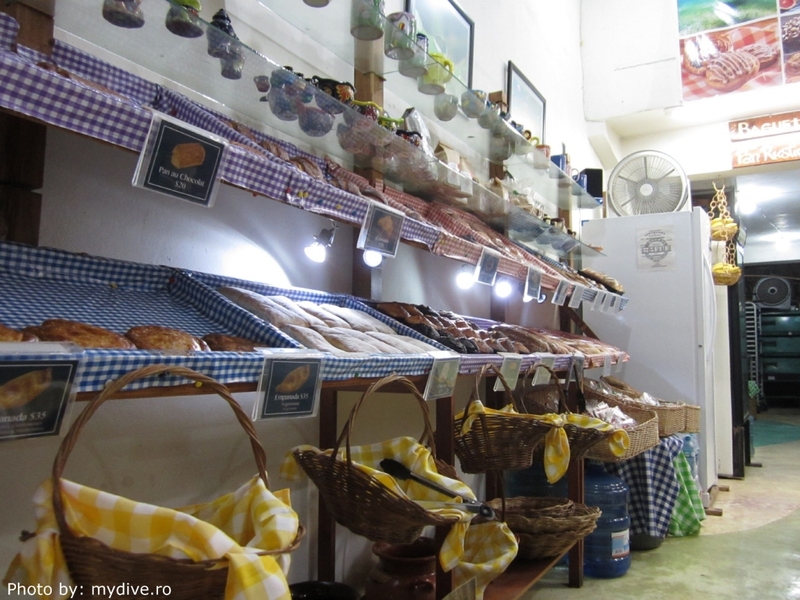 The price for lunch or dinner out varies, depending on the location, between 10 and 20 dollars. The cakes from the Mot Mot coffee shop are lovely and same goes for the honey lemonade. If you are lucky, Coral will take care of you, sweetening the gastronomic experience with her welcoming smile. If you are tired of the American “long” coffee, here you can also find espresso:). 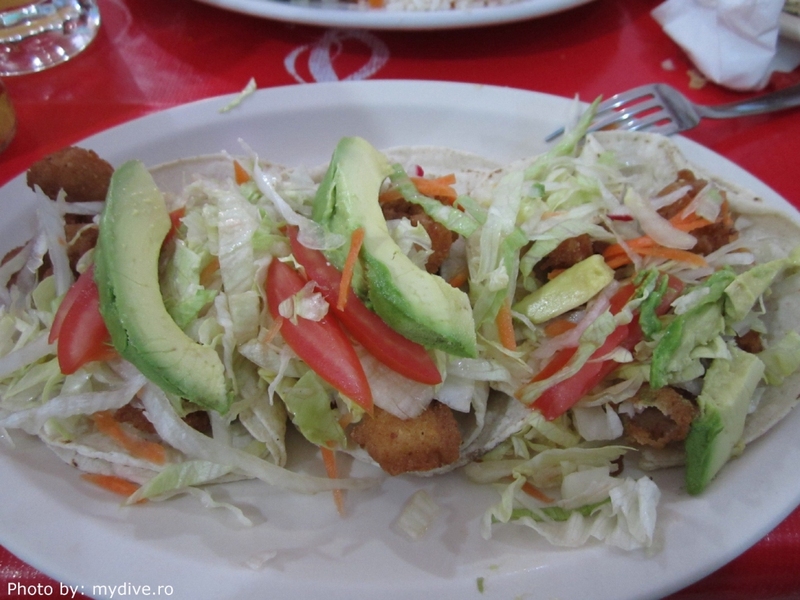 Try the seafood menu from El Camelito, restaurant preferred by the locals of Tulum. The prices are more than acceptable and everything in the menu is worth trying. 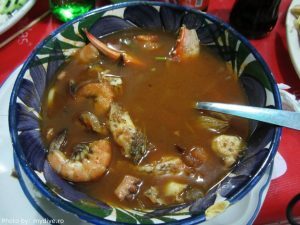 A special recommendation goes to the seafood soup (“sopa de mariscos” – very spicy), tacos with shrimps (“orden de camarón”) and mixed salad (“ceviche mixto”). Being full at any hour of the day, it is possible you’ll have to wait a bit until your order is taken and it might be difficult to find place for large groups. Tulum is a friendly place for bikes, which can be easily rented from numerous locations. Smoking is ostracized in Mexico, so neither expect to be allowed in the restaurants, nor in the coffee shops, the airport and sometimes not even in the open, not even as a special designated area. In regard to safety, although Mexico has seen lately an increase in violence mostly related to drugs, Tulum remains a safe touristic destination. Don’t drink the tap water, which is not safe for consume, and don’t throw the toilet paper in the toilet bowl.